In October 2004 at the commemoration of the resting place of Sgt. 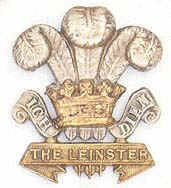 John O'Neill, V.C., M.M., 2 Bn Leinster Regiment, the President of the Association Major General The O'Morchoe CB., MBE., gave an address to members of the Association and their honoured guests, representatives of the Canadian Armed Services, The Irish Government and the family of Sgt. O'Neill. You can view the extracts of his address that relate to this process of reconciliation that was/is taking place. If you have a fast Internet Connection choose 'view with DSL' and if you use a 'dial-up' connection view by selecting view 56K. Viewing information: Watching the video clip uses a process known as streaming video. The DSL file size is 4.16 MB and the 56K file size is 578 KB. The better video quality is the higher of the two files. The video clip is a WMV (Windows Media Video) file that should automatically display with Microsoft Internet Explorer v6+. It has not been tested with any other browser at this time. Windows Media Video is developed by Microsoft and is normally viewed using Windows Media Player, a free application available from Microsoft. There is a link on each view page that can provide further information if you cannot see the video clip playing. If you have a Microsoft Windows operating system on your computer and regularly install Microsoft updates, you should not experience any problem.